Do you like Dragonfire? Share it with your friends. Dragonfire is an excellent perception game with popular pixel graphics. 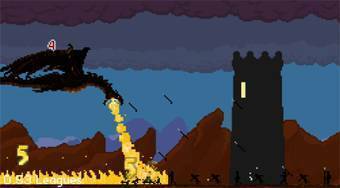 You will control the dragon in the game, trying to escape human attacks. Fly with the dragon in the sky, fire the fire by destroying attacking enemies on the ground and in the air and try to fly as far as possible. Buy up-to-date points to buy useful upgrades.